We propose Vibkinesis, a smartphone that can control its angle and directions of movement and rotation. 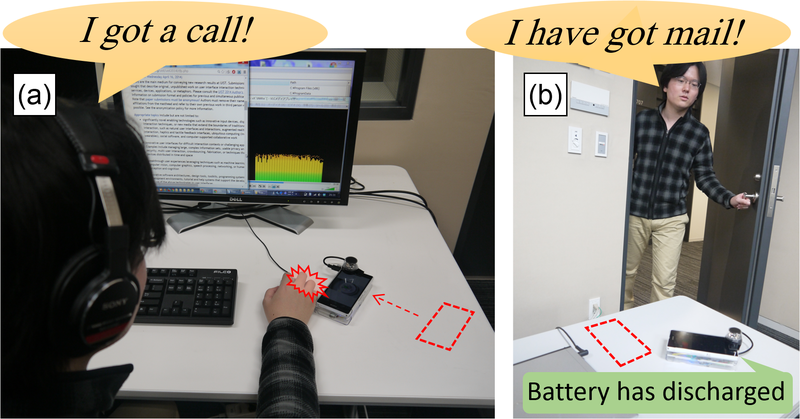 By separately controlling the vibration motors attached to it, the smartphone can move on a table in the direction it chooses. Vibkinesis can inform a user of a message received when the user is away from the smartphone by changing its orientation, e.g., the smartphone has rotated 90° to the left before the user returns to the smartphone. With this capability, Vibkinesis can notify the user of a message even if the battery is discharged. We also extend the sensing area of Vibkinesis by using an omni-directional lens so that the smartphone tracks the surrounding objects. This allows Vibkinesis to tap the user’s hand. These novel interactions expand the mobile device’s movement area, notification channels, and notification time span.